This inspirational book, following We Are All Born Free, contains 17 quotations about many different aspects of freedom, from the freedom to have an education to that not to be hurt or tortured, the freedom to have a home and the freedom to be yourself. All the chosen quotations are in simple words that can be understood by young children. Authors of the quotations include: Nelson Mandela, Martin Luther King, Harriet Tubman, Anne Frank, the Dalai Lama, Aung San Suu Kyi and Malala Yousafzai. Amnesty International has produced a stunning follow-up to their bestseller on human rights, We Are All Born Free (in paperback in March). 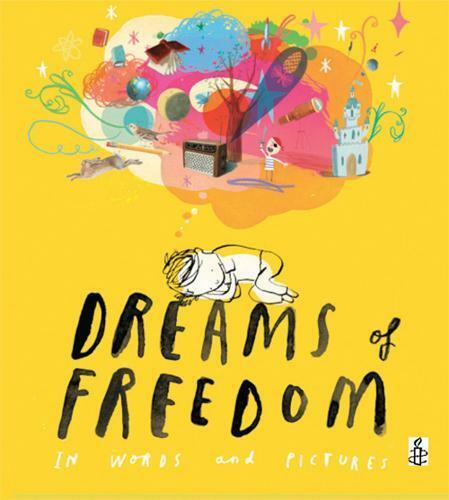 This new title, Dreams of Freedom, focuses on freedom and has quotes from inspiring figures, present and past, including the Dalai Lama, Malala Yousafzai, Nelson Mandela, Anne Frank and more. A foreword from Michael Morpurgo states that the book’s purpose is to inspire children to stand up for others and to make a difference. In true Amnesty spirit, illustrators from all over the world have added their beautiful brushstrokes to this book. Sally Morgan represents Australia and other contributors include Chris Riddell, Emily Gravatt, Peter Sis and Jackie Morris. All proceeds from the book go to Amnesty. This is an inspiring book that will spark discussion around injustice and inequality in the world. A necessary book for every school and public library, it also deserves a special place in every child’s home. It can be enjoyed by children as young as 4 when read with a parent, but readers up to 10 years old will also enjoy engaging with it.